Thailand signalled that its winning trend might continue in the future when they placed four representatives in three finals at the 2013 Dutch Junior Open, with an all-Thai final in the boys’ singles match and golds in both girls’ events. Twenty years ago, Thailand was not particularly accounted for in the badminton universe, even in Southeast Asia. However, in the last few years, the Thai flag has been seen with increasing frequency during the high level tournaments and what began as dominance in junior events has turned into better results on the senior stage. Also, while the trend has been particularly pronounced in the women’s singles discipline, Sitthikom Thammasin looks set to add to that as he took his second junior title in a row, this time in an all-Thai boys’ singles final. Troubled by a right leg injury, Sitthikom Thammasin (pictured below with Pannawit Thongnaum) played cleverly with more variation on his strokes. Repeatedly asking for permission to towel down, Thammasin, who is the top junior player in Thailand, prevented his compatriot and second best Thai junior player Pannawit Thongnuam from finding his rhythm. The players embraced when the game ended with a victory in straight games, 21-18, 21-17 to Thammasin. In the girls’ singles, Sarita Suwanakijboriharn played hard cross-court smashes to dismantle Ho Yen Mei’s game. The Malaysian number one junior played tricky and well placed shots however, with good court coverage and hard smashes, Sarita took the first game 21-17. In the second game, Ho played the same strategy, only with fewer mistakes. Ho simply needed one point to force a decider when her flicked service hit the net. The following points were more about mental strength, as Sarita recovered to eventually see Ho off in straight games by snatching the second 23-21. “I just followed my instinct. So my instinct said high service, and I did. Unfortunately, it failed,” said Mei Ho, smiling when asked about the critical point in the second game. 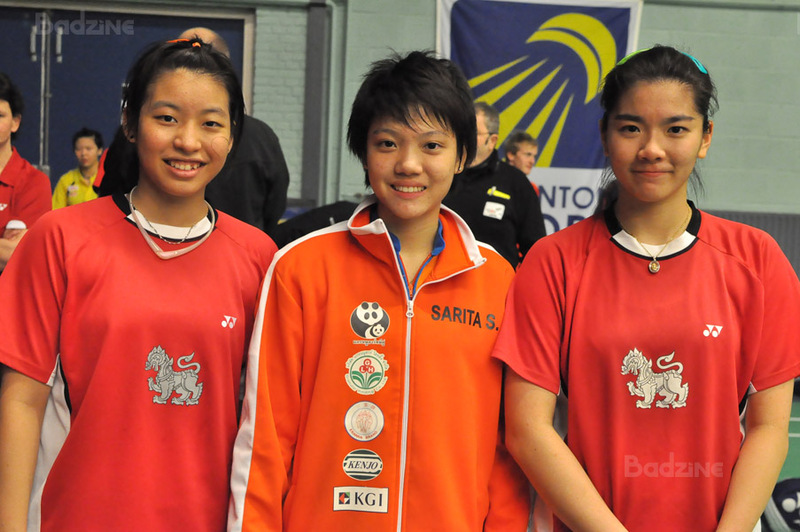 In the girls’ doubles, Thais Narissapat Lam and Ruethaichanok Laisuan (pictured top with Sarita Suwanakijboriharn) also had to face the Malaysian force, Joyce Choong and Yap Cheng Wen . The Thai pair played with more dimensions, and Lam, who has already earned a Grand Prix Gold title, having won the Thailand Open with veteran player Saralee Thoungthongkam, looked sharp and dominant, and controlled the pace of the game. “She is much more experienced and plays better. She has played at senior level and beaten top players, and has even won a grand prix,” said the proud Laisuan about her partner as the Thais won the match with a straight game victory. 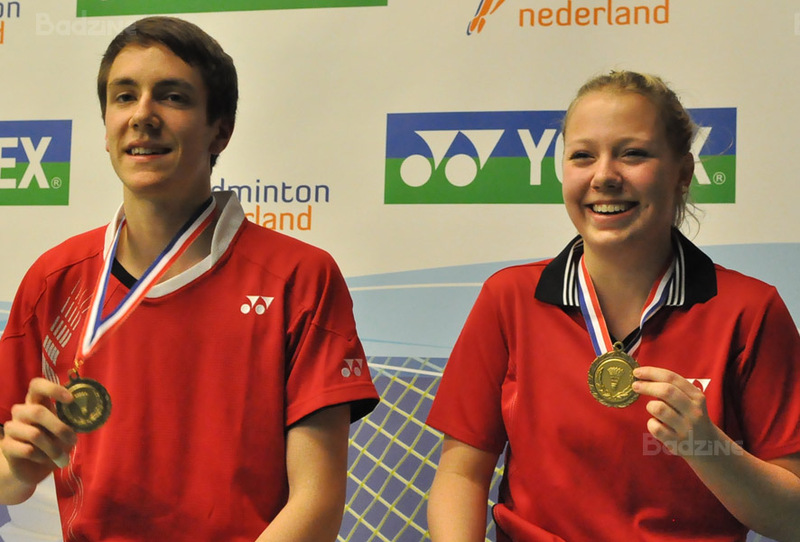 In the mixed doubles final, the German pair did not meet an equal opponent. Mark Lamsfuss and Franziska Volkman (pictured left) played against the Hong Kong pairing of Tan Chun Man and Ng Wing Yung, who surprisingly played with low self-esteem and seemed to want to be anywhere but on court that day. Reading the situation, the Germans played aggressively, harvesting point by point from a much weaker Ng. “Earlier we thought that the match would be a lot more difficult. However, it seems they did not play well today. Indirectly, we did not target the girl. Our tactic is to separate them,” explained Lamsfuss. The boys’ doubles final was the closing match and was particularly exciting. 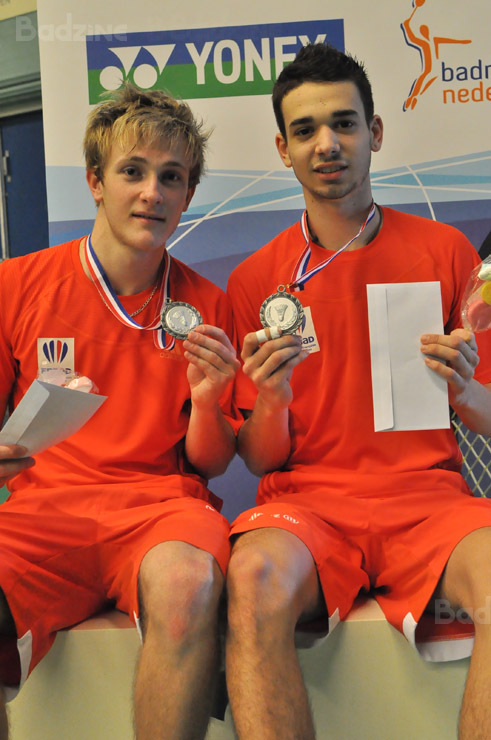 The French Antoine Lodiot and Julien Maio (pictured right), who in the semi-final destroyed the last Dutch representatives, faced the newly paired Chua Khek Wei and Woon Mun Choon (pictured below) of Malaysia. The high-spirited Malaysians played with accurate defense and attack to claim the first game, thanks in part to a number of unforced errors from the French side. In the second game, the Malaysians lost their focus owing to several service faults called by the service judge. The French boys came back and found their game, forcing the Malaysians to play more defensively, eventually the second game belonged Lodiot and Maio. In the third game, and Malaysians crawled back, rediscovered their spirit and an excellent defence, launching full-swing attacks. 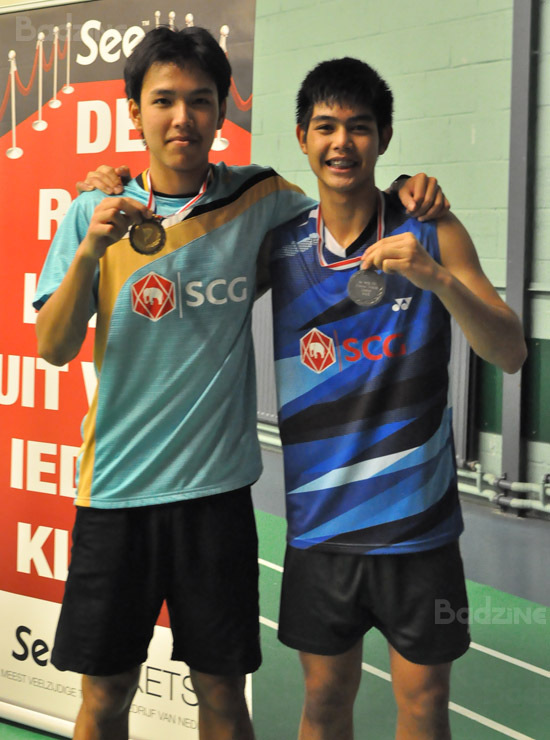 Chua Khek Wei and Woon Mun Choon won the title by claiming the third set 21-18.